If he and all the other defendants had been degraded perverts, if all of the leaders of the Third Reich had been sadistic monsters and maniacs, then these events would have no more moral significance than an earthquake or any other natural catastrophe. Nearly every day for seven months, Leon Goldensohn, the son of Jews who had emigrated from Lithuania, sat face to face with the likes of Rudolf Hess, Hermann Goering, Julius Streicher and Rudolf Hoess, the commandant of Auschwitz, where world leaders last week marked the 60th anniversary of the liberation of the death camp. 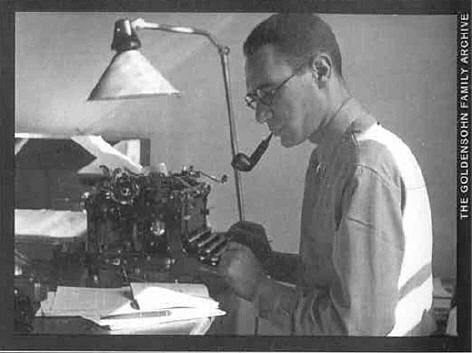 The papers reveal a man who interviewed these monsters with the probing and mostly dispassionate demeanor of a journalist, noting their mannerisms and moods as well as their words. He tried to drill through to the pieces of the men that might offer some answers about how and why, about the nature of evil. In this world of inflated language, monsters are everywhere. Generally, the ones with capital letters are pretty benign fellows. A quick survey of children’s books turns up a Sea Monster, a Garbage Monster, and a Monster of Manners, as well as a Monster in the Closet and Monster under the Bed. Want a quick boost? Drink Monster Energy Drink. Need to bulk up? Monster Food is just the ticket. And of course, there’s the Bay Area’s newly christened sports arena, Monster Stadium. Lowercased monsters are harder to find. They’re the scary guys. They used to lurk in the corners of myths, inhuman creatures whose horrendous deeds sent chills up the spine of listeners and storytellers alike. But nowadays, they usually hang out in tabloid reports of child molesters and serial killers. And, it turns out, in major-media stories about Nazi leaders. 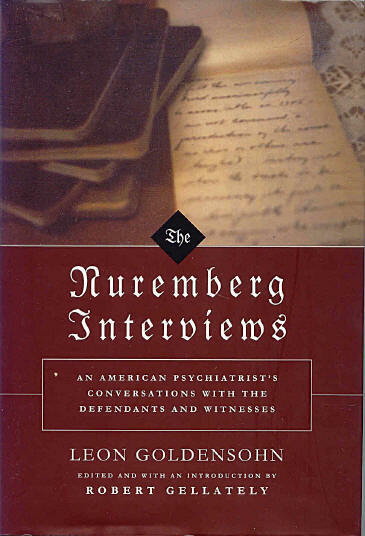 Last October Knopf published The Nuremberg Interviews, a collection of interviews that American psychiatrist Leon Goldensohn recorded with Nazi defendants and witnesses during the Nuremberg Trials of 1945-46. Newsweek, which reviewed the book under the headline “Monsters on the Couch,” noted, “The prison at Nuremberg was a hospice for spiritual incurables, beyond the help of psychiatry.” Welcome to the tabloid world of child molesters and serial killers! Flash back to 1961, when Stanley Kramer’s Judgment at Nuremberg burst onto the scene, exploring the complicated world of post-war Germany and presenting movie audiences with the first chilling film clips of the Nazi concentration camps. The movie is an anachronism — 3 ½ hours of dialogue, mostly courtroom speeches, filmed in black and white. And it’s gripping. Judgment at Nuremberg is all about assigning responsibility — who brought such misery and devastation not only to Germany but to all of Europe? For the defendants, it’s obviously a life-and-death question. But it was a question that the other participants were wrestling with as well. The issues facing Germany in the 1930s and 1940s — racism, economic and political unrest, fear of foreign invasion — belonged to the entire world. How far should people go to ensure that their homeland will survive? Despite the Chronicle’s characterization, the defendants at Nuremberg were not “charged with carrying out genocide.” It’s telling that, as Samantha Powers demonstrates in A Problem from Hell, the powers of the world did not recognize “genocide” as a crime in 1945. And the Nuremberg defendants were indeed charged with crimes. The Charter of the International Military Tribunal at Nuremberg outlines the charges against each defendant. They're worth taking the time to read. They list the kinds of actions that the Allies — the victors in World War II — to be against the law. And by law, their perpetrators were punishable as criminals. Leaders, organizers, instigators, and accomplices participating in the formulation or execution of a Common Plan or Conspiracy to commit any of the foregoing crimes are responsible for all acts performed by any persons in execution of such plan. Survival as what? A country isn’t a rock. It’s not an extension of oneself. It’s what it stands for when standing for something is the most difficult. The issues at stake were not personal; they were political. And they could only be settled by political means. To belabor the obvious, issues like these were the reason that human beings instituted governments. The public interest depends on private character — on integrity, and tolerance toward others, and the rule of conscience in our own lives. Self-government relies, in the end, on the governing of the self. That edifice of character is built in families, supported by communities with standards, and sustained in our national life by the truths of Sinai, the Sermon on the Mount, the words of the Koran, and the varied faiths of our people. When the political becomes personal, it leaves a big empty space for monsters. And if you're little and weak, no "edifice of character" can protect you from their insatiable appetite. As "spiritual incurables," monsters are outside the law. You know the old story. They came for the Communists, and I didn’t speak up, because I wasn’t a Communist. Gulp! They were gone. They came for the Jews, and I didn’t speak up, because I wasn’t a Jew. Gulp! They were gone. Gulp! They came for the Catholics, and I didn’t speak up, because I was a Protestant. Gulp! They were gone. And they came for me.